The choice to rent a storage space is a smart move for anyone looking to minimize clutter, ease a life transition, or keep seasonal items ready for their next use. Storage units can save time and space, giving you more of both. When looking to reserve a unit, our customers often have a few questions about what types of items can and cannot be put into storage. Our storage units are perfect solutions for so many things, but there are few items that for legal or safety reasons should never be stored in them. We put together this resource to help answer some of the questions that may arise when making storage decisions for personal or business use. Seasonal Items: From rolls of wrapping paper to fishing rods, there are many items that we only need at certain times of the year. Boxes of winter or summer clothes, sporting equipment (e.g. skis, snowshoes, or surfboards), camping gear, holiday decorations, and all those plastic Easter eggs are great items to store in a storage unit. Even equipment like leaf and snow blowers or lawnmowers are fine, as long as they are drained of fuel. Having these seasonal items out of the way the rest of the year means less stress and clutter. Household goods: Most household goods are acceptable for storage units. 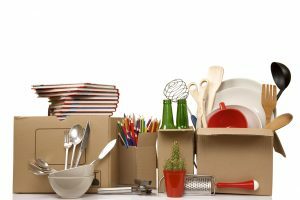 Books, furniture, toys, clothes, linens, kitchen items and office supplies all of these make great use of storage space. Storing these during a move allows our customers to move at their own pace to unpack after a life transition. Commercial goods: Storage rentals can take a lot of the stress out of any move—even for a business. Office furniture, supplies, equipment and decor are great items to store. Many product and service supplies can be safely stored, as well as shipping and packaging supplies. Storage units are also beneficial for storing file cabinets of paperwork that is not needed on a daily basis, but which can’t be discarded for record-keeping purposes. Electronics: Most electronics are acceptable for storage rentals. This would include TVs, DVD or Blu Ray players, gaming systems, digital devices, stereo systems, and other computer equipment, like monitors and printers. Many of our customers prefer the security of our facilities for these valuable items. Note, however, that electronics fare best in climate-controlled environments. Appliances: Appliances can be stored as long as they are cleaned and dried prior to storage and are never left plugged in while being stored. This would include refrigerators, stoves, microwaves, washers, dryers, and freezers. Smaller appliances, such as toasters, coffee makers, vacuums, and paper shredders are also fine, as long as they are wiped clean of crumbs and dried on drips beforehand. Hazardous Materials: At the top of the list of unpermitted items is anything that can catch fire or explode. Gasoline, propane, oil, grease, chemicals, cleaners, or paint are in this group as are fireworks or explosives. This category applies to anything toxic or hazardous, even biological waste, fertilizer, and asbestos. It also includes anything that is considered an illegal substance and anything radioactive. Unregistered Vehicles: The only vehicles that can be stored are those that are fully registered, insured, and in operable condition. This includes boats, RVs, trailers, motorcycles, cars, and trucks. Anything not registered by the person renting the space cannot be stored at the facility. Weapons: In most cases, firearms and ammunition are not permissible in storage rentals. Specifics about these particular items can be obtained by contacting the storage company. 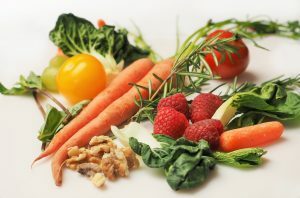 Perishables: This includes food items such as produce, meats, dairy, cereals, and rice. This also includes and animal products, such as pet food. These items can attract bugs and rodents, or encourage bacteria or mold. Living Animals and Plants: Storage units are for non-living things. It is illegal for any person to reside in a storage rental, animals of any kind are forbidden, and even plants are not allowed. Nothing that requires light, food, and water to live can be kept in a storage unit. At Bargain Storage, our friendly and helpful staff can assist you with any questions you might have regarding the do’s and don’ts of storing your belongings. Find a local storage expert or contact us online to speak with a team member in your area. 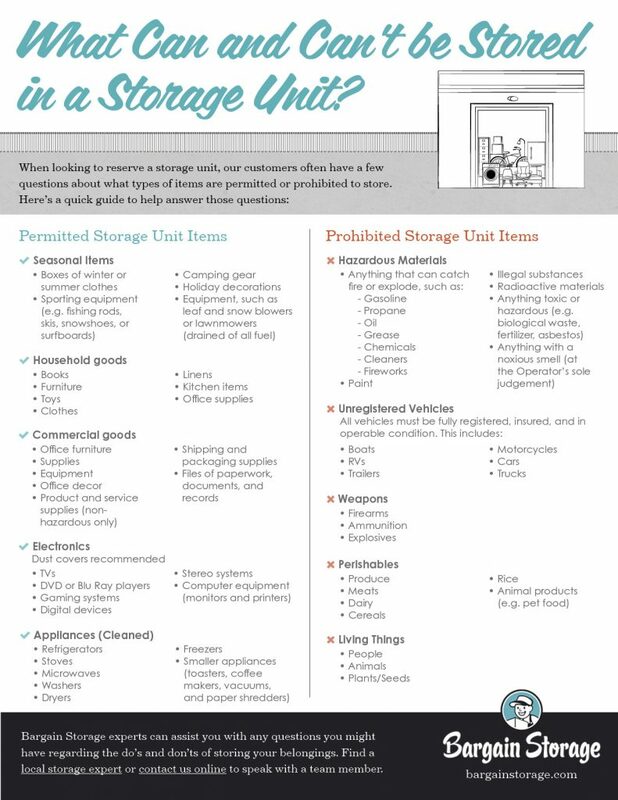 Questions about permitted and prohibited items in a storage unit?